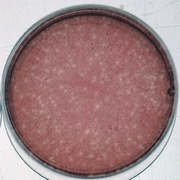 Genetic Transfection is a very useful and basic molecular biology technique of introducing nucleic acids into cells. In general terms, to transfect means to introduce genetic material (DNA, RNA, siRNA) into eukaryotic cells using chemical methods and without the use of viruses or electroporation machines. Transfection works by transferring or transporting the genetic material into cells by opening pores into the cell membrane. A couple of chemical methods are available to perform this function, but the most efficient and popular of which is through the use of cationic (i.e. positively charged) lipids, typically referred to as the �transfection reagents�. Once added to the negatively charged DNA, the lipid micro droplets encapsulate the DNA or RNA molecules and allow the mix to be packaged into a tight sphere called �plasmid lipoplexes�. 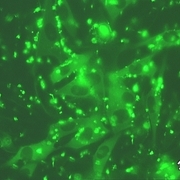 Transfection occurs when the lipoplex vesicles merge with cell membranes, both made up of phospholipid bilayers, therefore transferring the material to be delivered inside the cells. Lipid based transfections, or �lipofection�, have multiple advanges, like low cost (especially when compared with viral and electroporator-based methods), ease of use, reproducibility, flexibility, low cell toxicity, and high efficiency. Another great advantage of lipofection is its popularity and long history, which translate into multiple citations and scientific groundwork that vastly assist scientists in their choice of reagents and protocols. 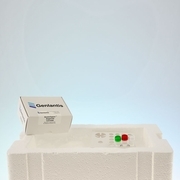 As a leader in lipid-based transfection technologies, Genlantis has been introducing novel transfection reagents since the late 90�s. The company�s approach to the idea of finding improved lipoplex delivery systems was by building a large library of lipid molecules and developing a high throughput screening methods that found the highest transfection efficiencies and lowest cytotoxicity. The combination of fast screening and a large library (150+) of pure cationic amphiphiles translated into the discovery of new lipids and lipid formulations that offer significantly improved transfection levels in vitro. 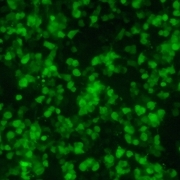 Today, Genlantis offers a wide array of reagents for the transfection of the majority of known molecules, and into the majority of known cells and cell lines. The GenePORTER� line of Transfection Reagents has evolved throughout the years, and users have a choice between the GenePORTER 3000 Reagent for hard-to-transfect cells, or GenePORTER Gold for the most common and easy-to-transfect cells. To transfect siRNA molecules, Genlantis offers the widely-used and highly-effective GeneSilencer siRNA Transfection Reagent, the first reagent to be offered specifically in the area of RNAi research. The BioPORTER Protein Delivery Reagent is the answer for the many scientists who prefer this more direct method of studying protein function and effects into cells. 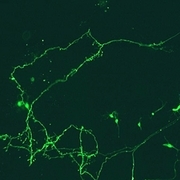 For scientists working with neurons or primary cells, Genlantis offers a choice between the NeuroPORTER Reagent lipid, and the NeuroFECT� Transfection Reagents polymer.